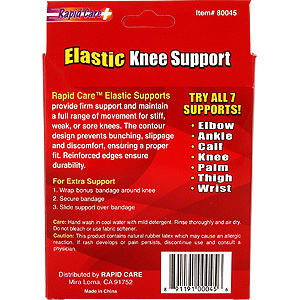 Rapid Care Elastic Supports provide firm support and maintain a full range of movement for stiff, weak, or sore knees. 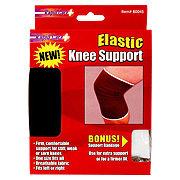 The contour design prevents bunching, slippage and discomfort, ensuring a proper fit. 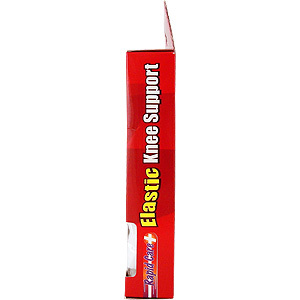 Reinforced edges ensure durability. Care: Hand wash in cool water with mild detergent. Rinse thoroughly and air dry. Do not bleach or use fabric softener. 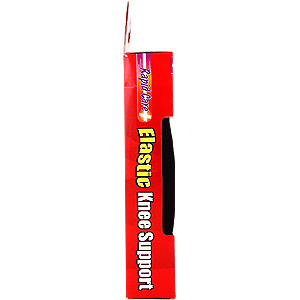 Caution: This product contains natural rubber latex which may cause an allergic reaction. If rash develops or pain persists, discontinue use and consult a physician. 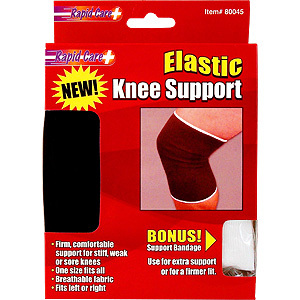 Elastic Knee Support is shipped in a discrete, unmarked package. Orders are processed immediately and usually take about 3 to 5 working days to be received. Any information received is used only for order processing and shipping purposes. Your information, such as e-mail address, will never be disclosed to a third party.